The town of Pushkar is as holy as it is popular. Though it is one of the oldest Indian cities, its cultural tradition and heritage are quite well-preserved even today. The Pushkar Lake and the Brahma Temple attract a large number of pilgrims from India and other parts of the world. The famous Pushkar Fair or Pushkar Festival, which is also known as the world's largest camel fair, is a major crowd-puller for tourists and travellers from all parts of the globe. During your tour to Pushkar Fair, you can take a holy bath in the Lake Pushkar, visit the Brahma Temple of Pushkar, watch the pooja ceremonies and have plenty of fun at the Pushkar Fair Festival. Once you are in Pushkar and start enjoying, you will simply want to spend more and more days. 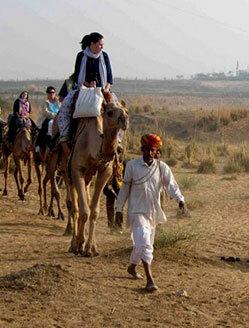 At Max Holidays, we bring you a wide range of Pushkar Fair Tour Packages with different duration and budgets. Since Pushkar is close to so many other popular travel destinations, you can also easily combine your Pushkar Fair Tour package with excursions to multiple nearby cities and towns. Some of the destinations which you may want to cover during your Pushkar Fair Tour Package include Ajmer, Jaipur, Jodhpur, Udaipur, Ranthambore National Park, Delhi, Shekhawati and Taj Mahal at Agra among many others. 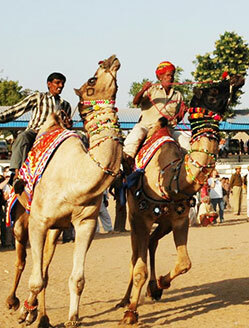 Each of these Pushkar Fair tour packages is specially crafted to provide you with a rich and unique travel experience. If you like to visit Puskar Festival on one of our Pushkar Fair tour package but want to change some part of the tour itinerary, all you need to do is send us an email or give our travel experts team a quick call and they'll tailor-make your Pushkar Fair Festival tour package. Located in the northwestern state of Rajasthan, the quaint little town of Pushkar is held in high regard by the Hindus. Its reference in the Great Hindu epics like Mahabharta and Ramayana speaks volumes about its religious significance. What's interesting about Pushkar is that it lies on the banks of a holy lake which is known as Lake Pushkar. You would not expect to see a lake in a desert region, would you? Small hills and sand dunes that surround Pushkar lend it a beauty of its own. Pushkar is at a distance of 11 km from Ajmer and 145 km from the city of Jaipur, the capital city of the state of Rajasthan. Being a popular Hindu pilgrimage destination, you will always find Pushkar humming with sounds of Puja ceremonies and chanting. Not just people from across Rajasthan or India but travellers from across the globe arrive in Pushkar to soak up the unique spiritual charm it offers. Steeped in myths and legends, the holy town of Pushkar is home to as many as 52 bathing ghats and around 400 temples. Most importantly, Pushkar features a couple of Brahma Temples (Lord Brahma is the creator of the universe as per Hindu Mythology) which you will hardly find anywhere else in the world. And Pushkar features a lot more for tourists. If you are travelling to Rajasthan, you should never forget to spend time in Pushkar. The town is a popular base for enjoying adventure-packed camel safaris across the expansive Thar Desert. Trekking is another activity which you can enjoy during your stay in Pushkar. Above all, Pushkar is famous for Pushkar Fair and Festival which is the world's largest camel fair held every year between October and November. 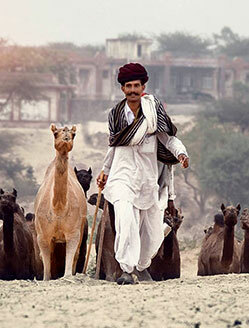 The soul inspiring Pushkar Fair is one of the most visited cattle fair in the world. 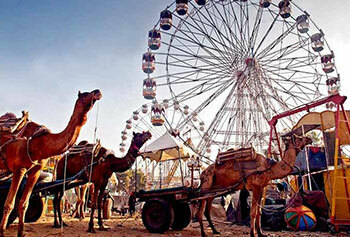 Pushkar Fair takes place every year during October and November months and definitely is the best time to visit Pushkar. However October to February is winter time in Pushkar and is considered as the best season for visitors. During this season, the temperature ranges between 20 degrees (max) and 8 degrees (min). The town experiences a hot weather during summers, from April to July. Temperature during summers can easily go up to 40 degrees. There is not much rainfall during the monsoon months but weather during this period remains humid. Summer and Monsoon period is the best time to avail great discounted offers for Pushkar tour packages and hotel accommodation. The best time to visit Pushkar is between October and February. The weather remains pleasant during this period. 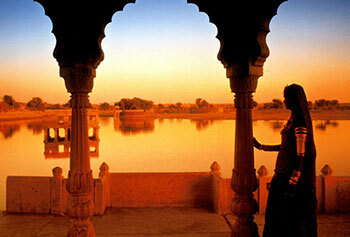 Rajasthan is a state of myriad colours in itself. 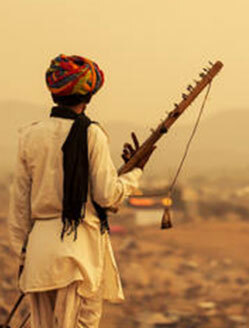 But it's at the Pushkar Fair Festival where you'll experience the colourful vibrancy at its best. When Pushkar holds the world's largest camel fair, it comes alive with a wide range of activities and festive celebrations. The liveliness of the atmosphere during that period inspires awe in all travellers, even in the most jaded ones. 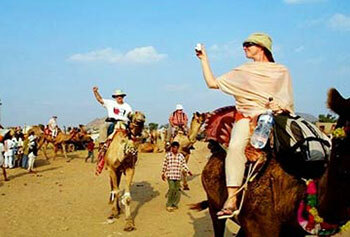 The Pushkar Camel Fair has increased the worldwide popularity of the state of Rajasthan manifolds. It is such a grand event that anyone who is present is completely engulfed with the amazing charm of the art and architecture of the Rajput Era. Pushkar Fair is an event where you can also have regular interactions with locals and know more about their life and art and craft. The Pushkar Fair Festival is at least a 100 years old, and is redolent with the glorious days of the past. During this festive time, you'll find yourself completely surrounded with musicians, dancers, acrobats and snake charmers from all across the state of Rajasthan. Don't think of the Pushkar Fair as just an event. This is an experience which allows you to discover the true character of Rajasthan while leaving you with countless beautiful memories that you'll want to pass on to your next generation with great pride and joy. And it will definitely leave you craving for more. If you plan to be a part of all the festivities and celebrations of Pushkar Fair that make up the Pushkar Camel Fair, you should arrive during October-November. According to the Hindu calendar, the festival falls in Kartik Shukl Ekadashi every year. Though the main goal of the festival event is to trade four-footed animals like camels, horses, goats and sheep, that is just the tip of the iceberg. The Pushkar Fair continues in all its glory and fervour for five days, each of which is full with rich unique experiences. You'll see cattle beautifully decorated and dressed at their best. Many of these animals also wear different types of ornaments made by the locals themselves. The sheer sight of beautifully decorated animals walking over the glistening sand dunes will fill your heart with utter joy. An array of performances put up by locals is a complete cultural retreat. Among other animals, the one that attracts the most attention is the camel. You can't imagine how elegantly they are decorated. Every camel owner tries to adorn their camel in the best way. Beautifully bedecked camels, as they walk and run across the desert, simply win over traveller's hearts. During the Pushkar Festival, you will get an excellent opportunity to watch a number of truly interesting cultural activities, village games and competitions. Locals from the length and breadth of Rajasthan and India arrive in Pushkar to compete in these contests and win prizes. The way camel races are held at the event will simply take your breath away. In one of the contests, the challenge is to sit on a camel's back while the camel tries to throw people off its back. A large number of spectators cheer the participants, which is a great sight to watch. You too will enjoy cheering the competitors for sure. This all also make Pushkar Fair for a heaven for the photographers who come here in a large number to capture tru Indian culture and lifestyle in thier cameras. If you like body tattoos, you'll love being in Pushkar Fair even more. You'll find a number of tattoo stalls at the fair. Locals set up these stalls and are known to create beautiful and unique tattoos on bodies. Last but never the least, the traditional Rajasthani dishes are also a major attraction for travellers in Pushkar Fair. These dishes are known for their spicy and delicious flavour. At the fair, you can gorge on a wide range of lip-smacking foods. All these dishes are cooked with pure ghee (oil) and Rajasthani spices. If you want to have a good eating time while in Pushkar Fair, you should never forget to try popular delicacies like Dal Baati, Sugery Churma and Missi Roti. Since Pushkar is also a pilgrimage destination, you will see a good number of devotees there as well – specially near the Pushkar Lake and the Brahma Temple. At the bathing ghats along the Pushkar Lake, pilgrims can be seen performing different types of pooja ceremonies and other religious rituals. During the Pushkar festival, all the temples in Pushkar are beautifully decorated, painted and illuminated. If you want to experience Hindu rites and rituals, the Pushkar fair is a great time to be in Pushkar Rajasthan. Devout Hindus consider Pushkar as one of the most sacred dhams. Pushkar has a number of tourist attractions that are worth seeing. Given below is a list of those places you wouldn't like to miss. Brahma Temple, Pushkar : The biggest crowd-puller in Pushkar for pilgrims is the Brahma Temple. This should be of special interest to you because there are only a handful of temples like these in the world – as far as Hindu mythology is concerned. According to Hindu traditions, the Brahma Temple came into being due to a curse by goddess Saraswati, Brahma's consort. Saraswati Temple, Pushkar : This a Hindu temple dedicated to goddess Saraswati. It is beautifully located on a hilltop from where you can have fantastic views of the holy Pushkar Lake. If you wish to have the best view, you should plan to reach the hilltop before dawn. Pap Mochani Temple, Pushkar : This is yet another temple located at an elevated place. If you are ready to spend a few minutes that the climb takes, you'll be able to get a wonderful view of the entire Pushkar town. Varah Temple, Pushkar : One of the holiest in Pushkar, the Varah Temple is dedicated to Lord Vishnu. The main feature of this temple is a huge idol of a wild boar, which is an incarnation of Lord Vishnu. According to Hindu traditions, Lord Vishnu took the shape of a Varah (wild boar) to kill a demon called Hirnayaksh. Shiva Temples, Pushkar : This is a group of temples dedicated to Lord Shiva. If you are in Pushkar, you should not forget to make a visit to these temples, located at a distance of 8 km from the town. Gandhi Ghat, Pushkar : Also referred to as the Gau Ghat, the Gandhi Ghat is named after Mahatma Gandhi, Father of the Nation. It was named so because Mahatma Gandhi's ashes were scattered here. Varaha Ghat, Pushkar : This is a famous and sacred ghat in Pushkar. According to Hindu mythology, this is the place where Lord Vishnu incarnated himself as a boar. Brahma Ghat, Pushkar : The Brahma Ghat is also of special religious significance because Hindus believe that Lord Brahma took a bath here. Holy Pushkar Lake : Of course, the holy Pushkar Lake is one of the biggest attractions in Pushkar. The history of this lake is steeped in myths and legends. Also known as Pushkar Sarovar, the Pushkar Lake has been mentioned in multiple ancient Hindu scriptures. What is more, even the coins dating back to the 4th century BC have mentions of this sacred lake. It is believed that taking a dip in this lake will wash away one's sins and cure skin diseases. There are many other places to see in the town of Pushkar. You'll see a number of other ghats and temples during your tour to the holy town. Other temples that are worth a visit include the Jain Temple, the Naya Ranji Temple and the Old Rangji Temple among others. If you want to take a bath at one of the many ghats in Pushkar, you are required to follow some strict guidelines. You should remove your shoes before approaching these ghats. Plus, you should remember not to make any comments that would hurt the sentiment of the Hindus or pilgrims. It's always a good idea to have a couple more days in hand when you travel to Pushkar so that you can also enjoy some great excursion tours from Pushkar. There are many popular and worth-seeing tourist destinations that surround Pushkar. Ajmer : Though Ajmer is a famous Muslim pilgrimage centre, it attracts people from all religious backgrounds. While in Ajmer, you should visit the Dargah Sharif, Lake Ana Sagar, the Edward Memorial Hall, the Government Museum and the Nasiyan Jain Temple. The Urs Fair at the Dargah of sufi saint Khwaja Moinuddin Chishti is a major attraction for both pilgrims and tourists. Kuchaman Fort : This fort is now a heritage hotel. A stay at this resort makes you travel back in time and enjoy a wide range of activities including camel safaris, horse safaris, village safaris and bird watching tour. This is also a great place for practicing yoga and getting Kerala massages. 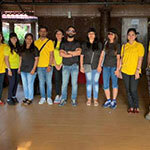 Roopangarh Fort : This fort too serves as a heritage hotel today. It was built with a view to bolstering the security of the town. You can be sure that staying at this heritage hotel will be a pleasurable experience. Kishangarh : This is a popular tourist destination. One of the major attractions in this town is the Kishangarh Palace. This is also the place where India's first miniature painting schools were set up. It was due to the patronage of Maharaja Sawant Singh that Kishangarh flourished in the field of art and poetry. Key attractions in Kishangarh include the Kishangarh Fort, the Phool Mahal and the Bhani Thani paintings among others. All in all, a great sightseeing experience! Sambhar Lake : An excursion tour to the Sambhar Lake, India's largest saline lake, is quite popular with tourists arriving in Pushkar. If you want to enjoy seeing flamingos, this is an excellent place. Apart from flamingos, you will also sight other bird species like storks, coots, sandpipers, red shanks etc. Shahpura : The town of Shahpura was established during the reign of Sujan Singh who took over in 1629. If you wish to dig into the history of the Sisodia Rajputs of Mewar, you should definitely visit this place. Jaipur : This is the 'Pink City', the capital city of Rajasthan, and one of the most travelled destinations in India. The entire city is redolent with the glorious history of the erstwhile Rajput maharajahs. If you want to enjoy sightseeing at its best, you should definitely include this city in your excursion tour list. Key tourist attractions in Jaipur include the City Palace, the Jaigarh Fort, the Hawa Mahal, the Amber Fort, the Jantar Mantar Observatory and the Nahargarh Fort. Shopping in Jaipur is also a great experience. Visit Tripolia Bazaar, Johari Bazaar, Nehru Bazaar and Kishanpol Bazaar to collect some of the best products and souvenirs. Jodhpur : One of the most famous desert cities in Rajasthan, Jodhpur is a truly picturesque travel destination. It is also known as the 'Gateway to Thar' because it is situated on the edge of the massive That Desert. Key tourist attractions in the city include the Mehrangarh Fort, the Jaswant Thada, the Umaid Bhawan Palace etc. Above all, Jodhpur is specially popular as a great camel safari destination. While you are in Jodhpur, don't forget to set out on a camel safari across the glistening sands of the Thar and have a memorable experience. In any case, do take a stroll in the Ghasmandi Bazaar which sells a wide range of art and craft items. Pushkar is quite well-connected with all the major cities in India. There are different ways to reach the holy town. Depending on from where you are coming, you can choose from any of these given options. How to reach Pushkar by air : If you prefer travelling by air, you can first take a flight to the Sanganer Airport, located in Jaipur. After your arrival at the airport, you can undertake a road journey to reach the town of Pushkar which is 146 km from Jaipur. There are regular flights to the Sanganer Airport from major Indian cities like Delhi, Kolkata, Mumbai, Indore, Udaipur and Jodhpur. How to reach Pushkar by rail :Ajmer (11 km) is the nearest railway station from Pushkar. First, you can catch a train to Ajmer and then cover the remaining distance via road. If you are coming from Delhi or Jaipur, your best train options include the Pink City Express and the Shatabdi Express. There are many other train services that you can avail yourself of to reach Ajmer from many major cities in India. How to reach Pushkar by road : Ajmer is the closest bus station from Pushkar. There are regular bus services from Ajmer to Pushkar. From Jaipur too, there are many bus services that will easily take you to Pushkar. There are several options to stay in Pushkar and around. During your tour to Pushkar, you can choose to stay at a palace hotel, a resort, a luxury tent or in a camp. Ananta Spa Resort, Pushkar : This is a luxury spa resort which sprawls over 9 acres. Here, you'll experience a fantastic combination of luxury and human touch. The resort offers all the facilities that a modern traveller may look for. Room types include Super Deluxe, Deluxe and Classic. Air-conditioning, internet connectivity and electronic safe are available in each of these room types. Oasis, a multi-cuisine restaurant, offers you a fine dining experience. For light snacks and an array of cocktails, the spa resort presents the Floats Bar. Gazebo is an open coffee shop. Other key facilities at the resort include outdoor swimming pool, fitness centre and indoor games. Orchard Luxury Tents, Pushkar: Owned by the Orchard Hospitality Private Limited, these luxury tents provides a wonderful stay experience. It is named 'Orchard' because the entire property is located in the midst of orchards of Amla (Emblica officinalis), an indigenous Indian fruit. There are 15 luxurious tents each of which is around 600 ft in area and has air-conditioning facility. The dining tent is named 'Golghar', which provides a 360 degree view of the surrounding gardens. It offers a wide range of both traditional Rajasthan delicacies and international cuisines. Key facilities include STD/ISD, Wi Fi, laundry, doctor on call, camel carts, escorts etc. Thar Camps, Pushkar : This is a private company which provides luxury camps in and outside of Rajasthan. If you plan to stay in a luxury tent, you should definitely opt for the services of this company. Air-conditioned and Deluxe Camps make for a great experience. Each of these tents has attached modern bathrooms and beautifully decorated interiors. During your stay in these luxury tents, you can also derive pleasure from campfires, folk performances by local artists and puppet shows. Enjoy a wide range of delicious Indian and Rajasthan delicacies in the luxury dining tent. The tents by Thar Camps come along with 24 hours water supply and electricity. Pushkar Bagh Resort, Pushkar : One of the finest accommodation options, the Pushkar Bagh Resort is a heritage hotel. A stay at this resort is special in the sense that it stands amidst beautiful surroundings and gives wonderful views of the mountains and the desert. The resort offers two types of rooms – Deluxe and Luxury. Each of these rooms comes along with private balconies, attached European style bathrooms, Wi-Fi connection, air-conditioning and antique furniture. It has a multi-cuisine restaurant called Surya Mahal and a coffee shop named Baradari. Rang Mahal is the bar where you can enjoy cocktails. The resort also arranges camel safaris, theme dinner at the sand dunes, village tours and excursions to nearby Ajmer and Makrana. Pushkar Fort, Pushkar : Located close to the Pushkar Railway Station, this is a prominent fort-turned-hotel. The hotel covers an area of more than 5 acres. It offers 10 Regal Rooms, 36 Royal Huts and 8 Deluxe Cottages. Each of the Regal Rooms and the Royal Huts is known for providing excellent views of the Aravalli Hills and the Thar Desert. All rooms are equipped with modern facilities and amenities. There are two multi-cuisine restaurants – Rajwada and Roof Top. The hotel has a nice bar named Rock in Desert. Lounge is the place where you can enjoy a wide range of snacks. Key services at the hotel include doctor on call, swimming pool, laundry, conference, library etc. There are special arrangements for folk dances and camel safari. 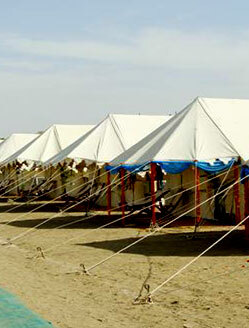 Heritage Camps, Pushkar : It offers two types of modern tents – Deluxe Swiss Tents and Luxury Swiss Tents. 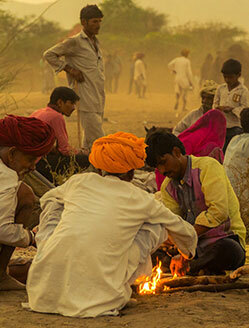 If you have always wanted to go camping in Rajasthan, the Heritage Camps will make your dream come true. Key facilities in these camps include hot water, western style bathrooms, round the clock service. The camps are pitched in the beautiful backdrop of hills. Puppet shows and camel cart rides are other features that you'll enjoy during your stay at the Heritage Camps. Sarovar Man Mahal, Pushkar : Built by Raja Man Singh I of Amer, this palace hotel is located very close to the Pushkar Lake and temples. While staying here, you'll be able to soak up excellent views of the banks. Hotel Pushkar Palace, Pushkar : The palace hotel offers 45 Deluxe Rooms and 5 Suites, each of which is equipped with all the modern facilities and amenities. Soak up the views of the lake and a garden in which the palace is set up. Key features of the rooms include period furniture, wall paintings and family portraits. Air conditioning, satellite television, telephone and mini bar are available in each room at the Pushkar Palace. Head to the German Bakery to savour fresh bakes. Important facilities available at the palace hotel are travel desk, doctor on call, laundry, car rental, money exchange, STD/ISD telephone, clock room, Kerala Ayurvedic massage etc. Jeep, horse and camel safaris are also available on request. Hotel Jagat Palace, Pushkar : This is another elegant palace hotel in Pushkar. The hotel features 82 Super Deluxe rooms each of which has been designed to give you a genuine taste of the maharajah lifestyle. Period furniture, Rajasthani artwork and wood work are the key features of the splendid rooms. 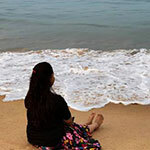 Major facilities include Air conditioning, Jacuzzi, TV, power backup, doctor on call, reading hall, travel desk, money exchange, car rental, mini bar, Wi-Fi, Kerala Ayurvedic massage etc. Pushkar Royal Camps : Royal Camps is a preferred option for all those travellers who wish to experience staying in luxury tents. There are 100 luxury tents in all, each of which comes along with customized veranda, bedroom and bathroom. During your stay in these tents, you can relish a wide range of traditional Rajasthan cuisines. Major facilities at the Royal Camps include doctor on call, car rental, running hot and cold water, safety locker, money exchange, internet connectivity etc. Horse riding, camel safari and village safari can be arranged on demand. Royal Desert Camp, Pushkar : Owned and managed by the Pushkar Palace, the Royal Desert Camp promises a true Rajasthani-style accommodation. A stay in these luxurious tents will remind you of the Mughal Era when the Mughal rulers would pitch royal camps for hunting and excursions. The Royal Desert Camp offers 200 tents, each of which is designed in a regal fashion. All tents have attached bathrooms and running hot and cold water. The dining tent provides heart-stirring views of the Thar Desert. The Royal Camps is located at just 600 metres from Pushkar. Gulaab Niwas Palace : An economy hotel which is quite comfortable & situated on the bank of Lake Pushkar. The hotel is run by a family who offers a personalized attention & services to all clients. The Westin Pushkar Resort & Spa : Ideally located to experience the various cultural & historical offerings of the holy city of Pushkar. The resort is located in a short drive from Holy Lake Pushkar & Famous Brahma Temple. Bhanwar Niwas Palace : Luxury Spa resort which is situated away from the crowd of the city. Located 10 minutes drive from Pushkar Lake. The Pushkar Fair is a grand event which features multiple exciting activities that you can indulge in. A host of adventure activities await your arrival in Pushkar as well. Just get ready to have plenty of fun. Tented Viewing Gallery : The Pushkar Fair is a huge scene of actions and events. Unless you are sitting in an elevated place, you can't catch all the fun happening at the fair in one glance. Thankfully, a tented viewing gallery has been created to provide you a complete view of all the action taking place. Which is more, the elevated arena also comes along with all the modern amenities you may look for. Pushkar Fair Opening Ceremony : The curtain at the Pushkar Fair rises with a grand opening ceremony. The hoisting of the Indian national flag to a special tune called Pushkar ki Pukaar is a pure spectacle to watch for visitors. In commemoration of the fair, a procession consisting of splendidly decorated camels and horses along with singers and dancers follows and after that the Pushkar Fair is declared open. If you are in Pushkar, you shouldn't miss this outstanding ceremony. Fusion Fiesta : Prominent fusion artists like Prem Joshua & Band, Advaita, Mohammad Irfan amongst others deliver mind-blowing performances. The entire Thar Desert seems to have come to life with this event. Hot Air Balloon at Pushkar Fair : Watching the entire vibrant scene at Pushkar from on board a hot air balloon is a memorable experience. Organized by the Sky Waltz Balloon, the Pushkar International Balloon Festival provides you with an excellent opportunity to go ballooning during the Pushkar Fair. Apart from indulging in this adrenaline-pumping activity yourself, you can also watch the Hound and Hare Balloon races and cherish the moments for years to come. Camel / Horse Rides at Pushkar Fair : One of the most popular crowd-pullers for visitors at the Pushkar Fair Festival are camel and horse rides. Adventure freaks from different parts of the world come and join in. Quad Bike Racing in Pushkar Fair : At the Pushkar Fair, you will also get an opportunity to see quad bikes in action. Enjoy watching this race as racers jump on this powerful machine and take on the desert. If you have always wanted to explore the Thar Desert, you will love doing it on a quad bike yourself. A quad biking tour can be as short as 15 minutes or as long as 1 hour, so you can choose as you please. 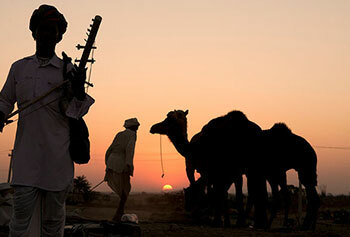 Sunset Safari Trip Pushkar : Camel rides are a common sight in the state of Rajasthan. But it's truly a unique experience watching camel carts swinging across the Thar Desert at sunset – in the midst of all the other action that goes at Pushkar Fair. Keep your cameras poised to capture the wonderful scenes. 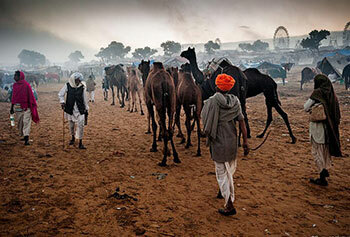 Pushkar Cattle Fair : This is the world's largest cattle fair. Cattle owners from every nook and cranny of Rajasthan travel to Pushkar during the Pushkar Fair to trade. Bedecked camels, horses, cows, goats and sheep make the entire scene at the Pushkar Fair look even more beautiful and colourful. This tradition of selling and purchasing animals in Pushkar has been going on for years. Holy Dip in Pushkar Lake : The history of Lake Pushkar is immersed in myths and legends. Hindus have deep regard for this lake because when Lord Brahma performed a sacrifice and threw a lotus flower, the flower fell at Pushkar and the next moment water sprang up from a spot that is today the Lake Pushkar. During the Pushkar Fair, a large number of devotees arrive at this lake to take a holy dip. Shopping in Pushkar Fair : For handicrafts lovers, the Pushkar Fair is certainly the place to be. At the fair, you'll see multiple stalls which sell a wide range of items of art and craft including necklaces, patchwork garments, printed textiles, colourful fabric and footwear. Bead necklaces from Nagaur and printed textile from Ajmer are some of the most popular products you should buy at the fair. Sports Matches in Pushkar Fair : The Pushkar Fair also attracts a lot of people to its sports matches. During your tour to Pushkar, you can enjoy watching traditional Indian sports like Kabbadi. Musical Concerts in Pushkar Fair : Visitors at the Pushkar Fair also get an opportunity of listening to soulful songs sung by lead Bollywood singers. After a tiring day at the Pushkar Fair, watching these performances is a perfect way to unwind. Other Competitions at Pushkar Fair : Many other cultural competitions like Camel Dances, Horse Dances, Turban Tying and Moustache Competitions are also organized at the Pushkar Fair. If you are a visitor, you may not realize how your days just passed. It's a grand event with so much fun and experience.